I have a confession to make… I love food trucks. When I see a line of colorful food trucks, I get butterflies in my stomach; I giggle like a kid and jump around outside. Some girls like designer shoes, I like street food. Ryan and I had an epic adventure completing Los Angeles Truck Madness last December, and it was only a matter of time before we continued here on the east coast. Providence is home to three college campuses, busy downtown businesses, and a thriving local restaurant scene. Three key elements for food truck survival. We found these trucks around the Brown Campus on Thayer Street and at the Hope Street Farmers’ Market this past weekend and were not disappointed. We feasted on everything from Mexican, to Korean, and even homemade charcuterie. Just when we thought it was too much, we found a dessert truck waiting. Here’s the breakdown on our street eats last weekend, with more to come soon! Hewtin’s Dogs Mobile – Hewtin’s is the mobile food truck of Chez Pascal restaurant, a well known fine dining French restaurant in East Providence. 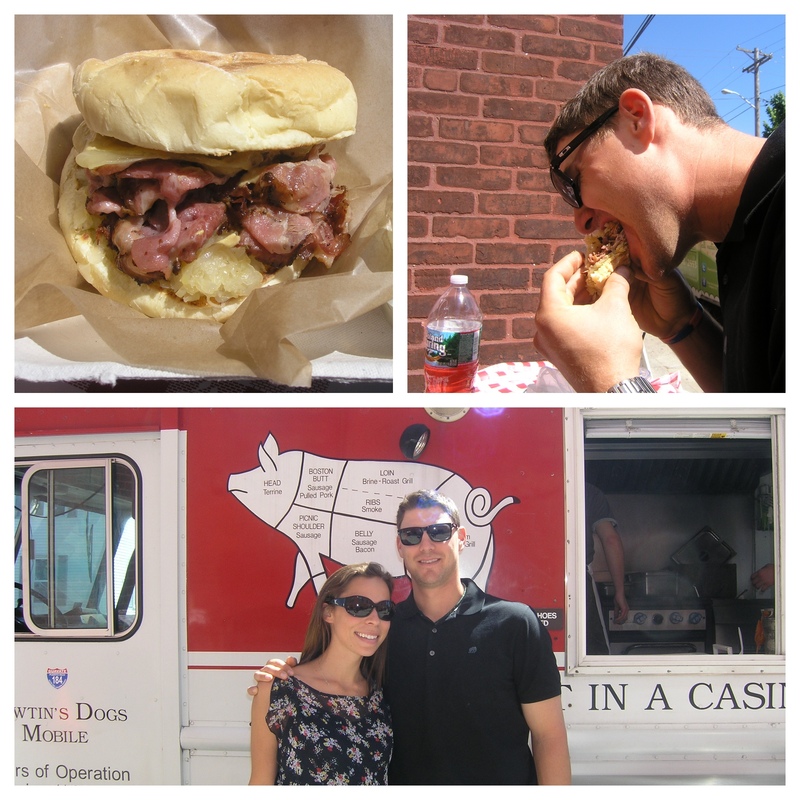 Hewtin’s offers gourmet street food- handmade sausages, cured meats, and even a meatloaf sandwich. My charcuterie teacher Chef McDonough would be proud of the products coming from this truck. We asked the vendors for the best item, and we were delivered a hot pastrami sandwich with sauerkraut, swiss, and dijon. Just a few ingredients, all made from scratch, and perfect. It’s a heavy meal, so I wouldn’t go back too often, but I want to go back. Soon. Mama Kim’s Korean BBQ – a staple on Brown University’s Thayer Street bringing Korean comfort food to students of all backgrounds. Their menu features sliders, wraps, and rice plates. I ordered a beef bulgogi slider filled to the brim with shaved sirloin, caramelized onions, mushrooms, and wasabi aioli. So many earthy and rich meaty flavors complemented with spicy wasabi and the acidity of fresh lime and cilantro. A well balanced and delicious snack. One wouldn’t be enough for a meal, but they have a number of large rice plates as well. I love Korean food, so I would go another time or two to see what daily specials are on the menu! Mijo’s Taco Truck – maybe it’s because I’m from Colorado, maybe it’s because I love Mexican food, but when I see tacos and burritos, I want to taste spice. I want flavor to make my eyes water, sizzle on my tongue, and linger after my meal. Unfortunately, I didn’t get that with Mijo’s carne asada tostada. It had all the right elements- black beans, stewed carne asada, queso fresco and guacamole- but everything lacked a little something in flavor. There’s another taco truck in the area that is pretty well known, and I’d be curious to see if Mexican food just isn’t the same up in New England as it is closer to the border. Flour Girls Baking Co. – the perfect ending to a delicious day. With a slogan of “a balanced diet is a cookie in each hand”, it’s hard to walk by Flour Girls without turning your head. Three words: Apple Cider Doughnuts. Piping hot doughnuts with a dusting of cinnamon and sugar. Even on a warm day these doughnuts had knee buckling affects. We didn’t initially purchase the side of milk, but the dunking capabilities should not be ignored. 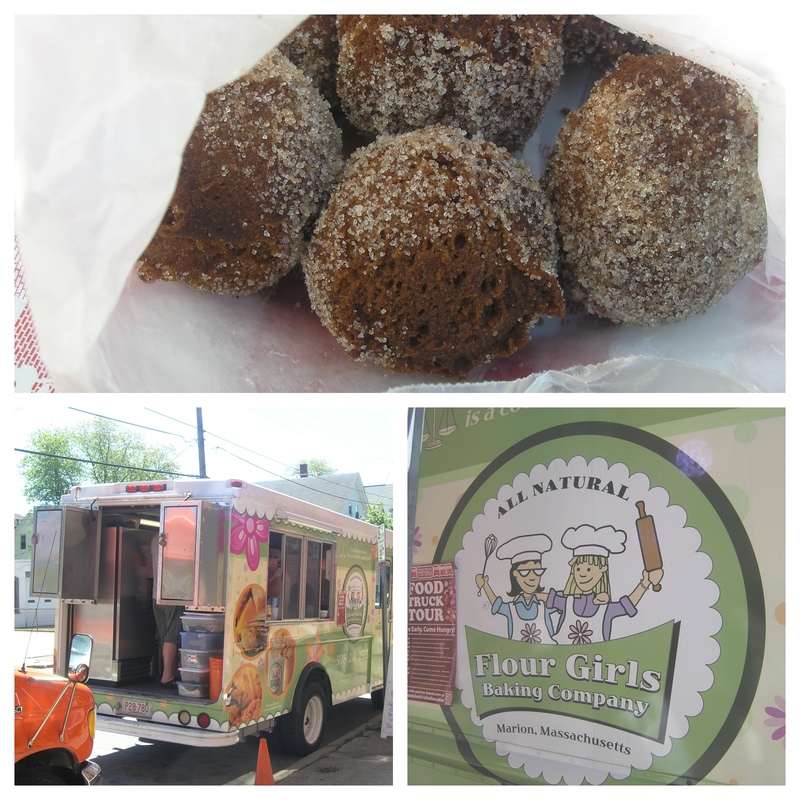 I can’t wait to find this truck again soon so we can try their famous ginger molasses cookies. Jaime, I loved this post (I love all your posts). Your descriptions are so fun to read! Now I want a hot pastrami sandwich. And a cookie. And maybe a doughnut. 🙂 I tend to be a bad influence. Thank you for such nice feedback! Superb review, I Love Flour Girls she is the best also try the whoopie pies they are to die for! After living in Maine I love whoopie pies! i can’t wait to find them again! They are always at Tabor Field in Marion during sports games – usually Wednesday afternoons – because they are based in this area. Enjoy!